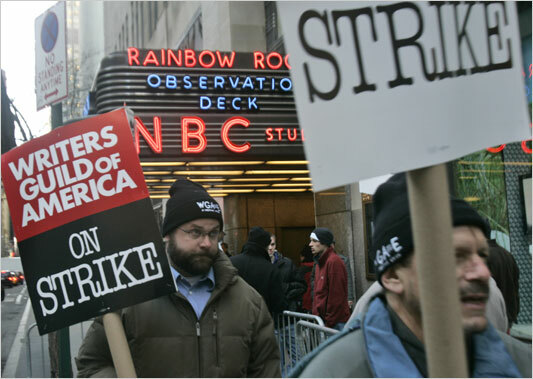 I’ve been thinking about the Writer’s Guild of America strike, and the spectre of little more than warmed-over reality television, reruns and poorly attended award shows. The voice in my head (which sounds a lot like Ralphie in “A Christmas Story”) yells in horror. No “Heroes” or Golden Globes, just six consecutive nights of “Deal or No Deal”? CBS will air repeats of Showtime’s “Dexter” sans profanity, which is sort of like sugar-free Godiva chocolates. It’s possible – but why bother? “Survivor: Goshen” – a new show about flatlanders trying to get directions out of a small New England town – is probably next. That one may actually be pretty good. But the rest of the stuff on the idiot box has been sinking fast for some time. Locking out the few remaining working writers is simply the denouement of a very sad story. What’s an entertainment-starved 21st century boy to do? For inspiration, I turned to the Internet. “Stripped of our “jobs” – we are still writers,” explains “Prison Break” staff writer Kalinda Vasquez in the recently launched “Why We Write” blog, which is a kind of primal scream forum for frustrated WGA members. Whatever the strike’s outcome, the creative impulse will endure and find a place to thrive. Indeed, the move away from these limiting confines has already begun. “The blank page is a magic box. It needs to be filled with something fantastic,” says filmmaker J.J. Abrams, speaking at last year’s TED Conference in Monterey, California. Don’t rent “Live Free or Die Hard” and hurt the cause of writers everywhere – this is television worth watching. Listen to the world’s most lovable lawyer, Lawrence Lessig, ponder our children’s “read/write culture” and its implications for our world. Writers will likely adapt to this changing landscape, which encourages flexibility and rewards the nimble. The same can’t be said for old institutions like network television, and their intractability in the face of this labor dispute could well hasten their end. Thursday: Putnam & Pirozolli, Sophie & Zeke’s – This jazz guitar duo trades lick with elegance and poise. Their set starts early, and includes everything from Gershwin to Hendrix. Gerry Putnam did a long run with popular band Night Kitchen, and Tom Pirozolli’s career has taken him all over the country. He’s made 6 albums in the process. It’s music that pairs nicely with a bowl of chowder and a mug of winter ale. Friday: Wherehouse, Salt Hill Two – My favorite local singer-songwriter steps up with his band. Wherehouse plays the kind of up-tempo selections from Van Morrison, David Grey and Dave Matthews that are staples at front man Jason Cann’s solo shows. They’re just meatier, more fitting to a full dance floor, to a crowd that wants to get involved with the music. You know who you are. Saturday: Stonewall, Heritage Tavern – Here’s a thought: catch Heritage open mike man Jesse Peters solo in Springfield at Apron Strings (a new venue – yay!). Then, cross the river to hear Vermont’s three-man army, playing both electric and acoustic tonight. Stonewall front man Josh Parker once tried going unplugged, to mixed success, for the staid patrons of Sophie & Zeke’s. It may work better with this rowdy crowd. Sunday: Fred Haas & Sabrina Brown, JOSA – Multi-instrumentalist Haas has performed with Oscar Peterson, Pat Metheny and Ray Charles. He alternates between piano and saxophone, complemented by the talented vocalist Brown. This “Jazz on a Sunday Afternoon” installment includes selections from his latest album, “Telling Stories,” along with Haas’s well-known improvisations. Tuesday: Richard Thompson, Hopkins Center – The title of tonight’s program – “1,000 Years of Popular Music” – is a bit misleading. Thompson’s only been around for half of that (I’m kidding). His first band, Fairport Convention, started out playing covers, so reaching back to the 13th century shouldn’t be a too much of a stretch. Wednesday: Open Microphone, Skunk Hollow Tavern – Wise Rokobili holds forth for amateur night in Hartland Four Corners. OK, “amateur” is an unfair characterization; anything can happen, from excellent to execrable. The one constant is the 20 or so minutes allotted to each performer to work through material. Should you take your act public or stick to lip-synching for YouTube? Here’s the place to find out.